Maps data by postal code or by location. To use this map type, the first column in your dataset must use either the location datatype or the zipcode datatype. Specifies the map projection used for the background map. Projections are different ways of representing the curved, three-dimensional surface of the Earth on a flat, two-dimensions map. When set to On, Antarctica is included on the map. When set to Off, Antarctica is not displayed. Specifies the color of individual data points on the map. Colors can be set using an RGB hex value or a CSS color name. 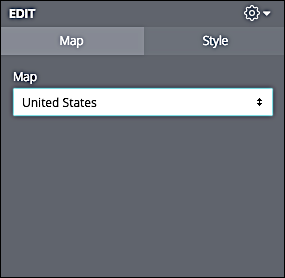 Specifies the background color of map regions. Colors can be set using an RGB hex value or a CSS color name. Specifies the border color for the map. Colors can be set using an RGB hex value or a CSS color name. Specifies the border color for individual map regions. Colors can be set using an RGB hex value or a CSS color name. Specifies the width (in pixels) of the map border. Specifies the width (in pixels) of the individual map regions. When set the On, the complete field name (including the Explore name) is included in map tooltips. When set to Off, only the Explore name is shown in tooltips. Specifies the size (in pixels) of individual map points.